For the record, I really do like Gmail. Once I made some adjustments to bring Inbox-like features into its environment — especially the inbox-based reminders, article-saving system, and smart extra shortcuts I'd come to rely on after years of Inbox living — I quickly grew comfortable with the Gmail desktop site and started feeling at home again. Even the Gmail Android app works reasonably well for my needs at this point, with the aid of a few handy hidden features. 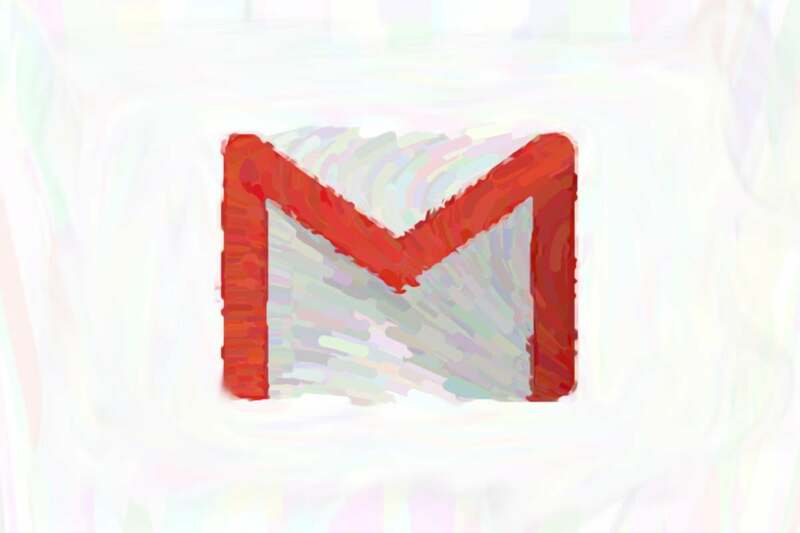 All in all, I firmly still believe Gmail is the best email app for most people on Android. But "most people" doesn't mean "everyone." And whether you're struggling to get back in the Gmail swing after your own Inbox adventure or you're just wondering if there's an alternative that'd be more effective for your personal emailing habits, it's well worth exploring your options. I'm constantly checking out the available email apps on Android and keeping tabs on what's out there. Right now, aside from Gmail itself (and Outlook, which is fine enough if you use Outlook on the desktop but nothing that's gonna grab you and win you over otherwise — along with ProtonMail, which is great but super-specific in its appeal), I see four Android email apps that deserve at least a moment of your attention. One of them is a new arrival to the platform, while another was recently resurrected after a brief bout of virtual death and the remaining two have both undergone some identity changes of their own as of late. All of them use Gmail as the foundation for their services, though (along with the options to add in different types of email accounts as well, if you're so inclined) — which means you can keep your existing address and avoid having to do much of anything other than sign in and see whatcha think. The lowdown: A long-time iOS and Mac user favorite, Spark launched on Android just last week. I've had the opportunity to test it out for a while already, and you know what? It's a pretty solid email app — nicely designed, pleasant to use, and fairly rich in features. The standout elements: Spark's primary calling card is its Smart Inbox feature, which attempts to sort your messages in a vaguely Inbox-esque way (though truthfully, it's much closer to Gmail's categories than Inbox's Bundles, with just basic sorting and no ability to set specific times for particular sections to be presented). The app's main view shows all of your unread messages separated out into cards for "Personal," "Notifications," "Newsletters" (which is really just more of promotions in general), and "Pins" (messages you've starred). One last card, "Seen," shows all of the read messages in your inbox. Spark also has a really interesting option for collaboration in which you and anyone else you add onto your team can chat about an email privately — in a dedicated "side chat" section that gets attached to the thread — and then assign specific team members to handle an email (with optional due dates and progress tracking) and even allow multiple people to edit a message simultaneously, with a real-time, Docs-style view. The app's design is fresh, clean, and generally just a pleasure to use. It's really customizable: You can control exactly what elements appear in the sidebar and in the action bar at the top, for example, and you can set both short- and long-swipe gestures in both directions for any commands you want (deleting, archiving, moving, pinning, snoozing, and so on). The app's built-in snoozing and send-later features are easy to use. The former even has a helpful option that lets you check a toggle and choose whether or not you want to receive a notification when the message comes back around, which is a smart and surprisingly uncommon touch. The whole Smart Inbox thing has been pretty inconsistent in its sorting effectiveness for me — sometimes even sorting emails from the same sender into different categories at different times. I love the idea in theory, but unless it works incredibly well, that kind of categorization can end up being more of a liability than an asset. It's something that's tough to get right, and most email apps — including Gmail itself — are similarly hit and miss in effectiveness. Perhaps most problematic for me is the fact that Spark doesn't have a companion web app — or Windows app, even — so unless you use a Mac (or you have a Chromebook and want to install the Android app there, which is a passable but not exceptional experience), you're limited to using the app only on your Android phone and then going back to Gmail on the desktop. Especially with Spark having its own sorting system and its own snoozing and sending-later mechanisms, that means your email will look dramatically different depending on which device you're using — and when you're on a desktop computer, you won't even be able to see any snoozed or scheduled messages, since those live exclusively inside of Spark while they're pending. No bueno. 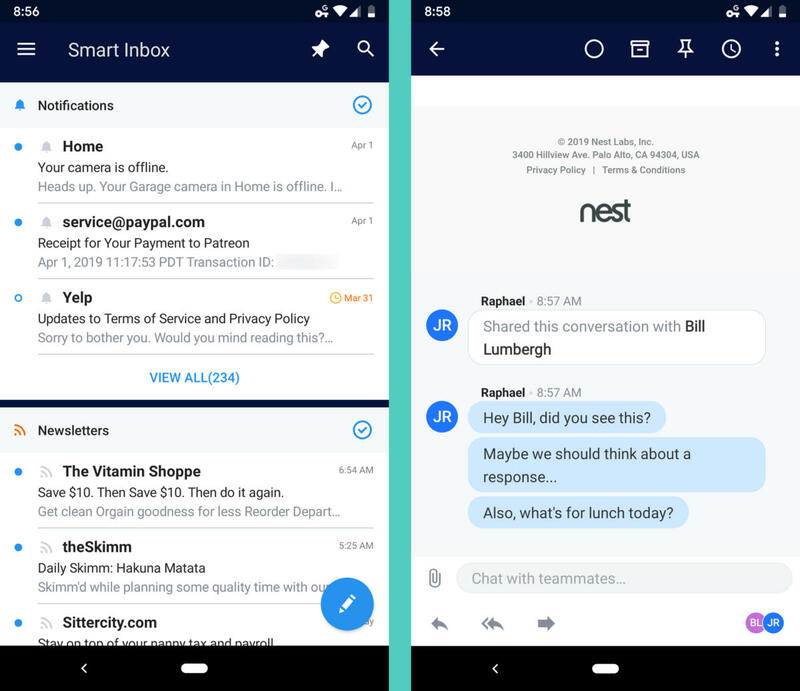 The verdict: Spark is one of the nicer email apps to use on Android, and its team collaboration feature has the potential to be transformative in the right scenario. The present lack of a web and Windows version, though — something the company says it's working on, vaguely — should be a serious concern for anyone who uses a desktop computer without a giant Apple logo on its exterior. There's no web client, and the Windows client is limited to Windows 10 and higher — so if you're using a Windows 7 system, you're out of luck, and with a Chromebook, your only option is to install the Android app and use it there (an experience that's better than Spark's but still not entirely ideal). The app isn't free to use, even on an individual-user level, and you may or may not find it provides enough value over the other available options to justify its ongoing cost. Especially after the Inbox saga, it's hard not to think about an email app's long-term potential and how likely it is that you'll have to make another change at some point in the foreseeable future. Given Newton's recent history and Essential's ongoing struggles, there's no telling what the plan might be for the software in the long haul (or, let's be honest, how long Essential itself will even be around, for that matter). The verdict: Newton is a decent Gmail alternative for a specific sort of user — but on Android, specifically, the value it adds over Gmail is fairly limited and may not be enough to make it a worthwhile move for most people, especially considering its cost and its question-filled future. If you really dig what it's doing, though, maybe it's worth the investment and present uncertainty for you. 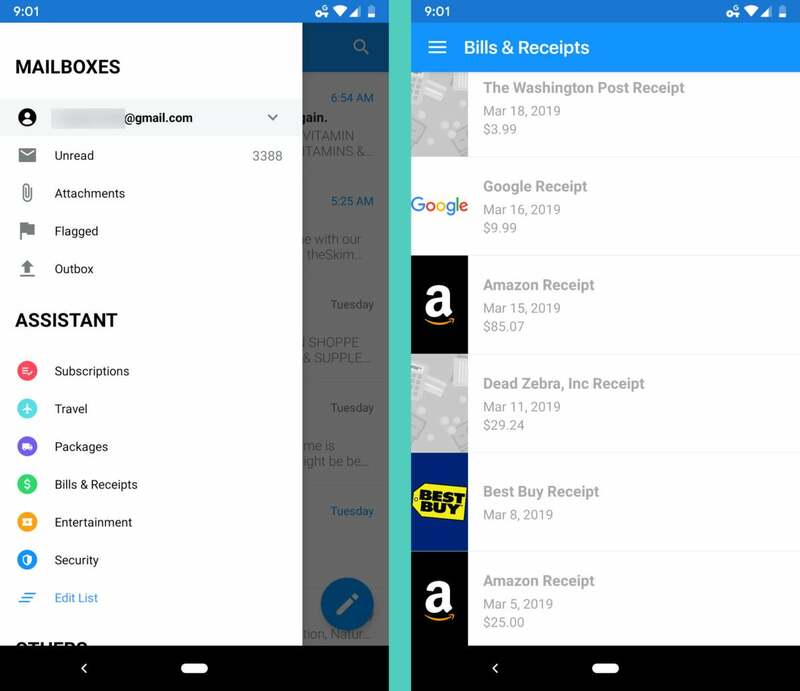 The standout elements: The app has an Inbox-esque mail-sorting system that can identify and categorize certain types of messages — subscriptions, travel, packages, bills and receipts, and entertainment. 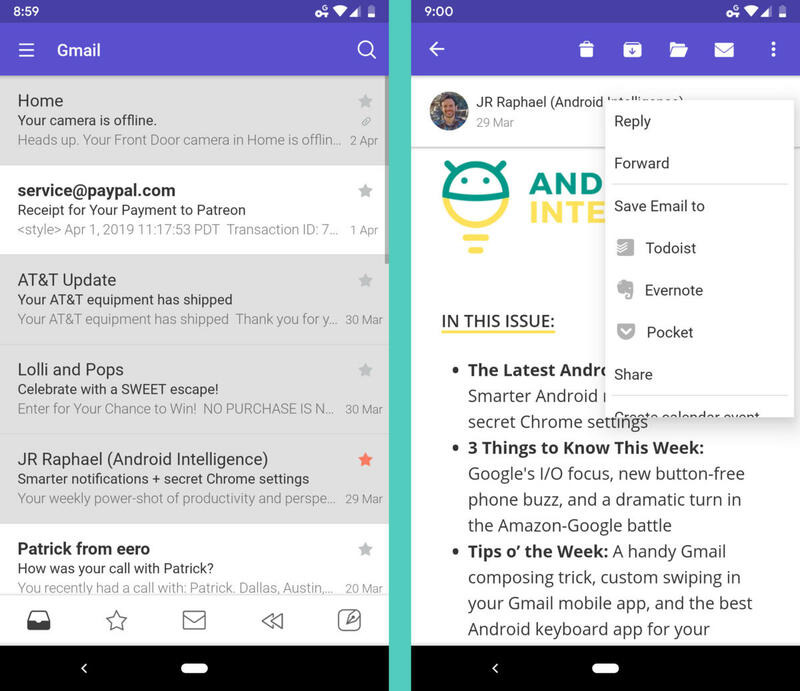 The app's creators also work hard to present speed as a key differentiating point, dubbing Edison the "fastest email app available for Android." Edison's mail-sorting system actually works quite well in my experience — a rare feat, as you've probably figured out by now. The app does feel fast — though honestly, if there's any difference between it and other mail clients (including Gmail), it's pretty minimal and tough to discern on any real-world level. In what seems like an odd twist to me, Edison's sorting system doesn't prevent sorted messages from appearing in your main inbox view; instead, messages that fall into any of those aforementioned categories appear both inside your inbox and in their appropriate category sections, which are accessible via a slide-in menu on the left side of the screen. Not entirely sure I get the point or the value of that setup. No web or native desktop versions of the app are available at all, so aside from maybe running the Android app on a Chromebook, you're basically stuck using something different (like Gmail) whenever you're on a computer. I'd be remiss not to mention the fact that Edison was explicitly called out as part of a recent WSJ investigation into how some Gmail app developers have allowed human employees to read users' emails (with personal info redacted, in the case of Edison), even though their policies never warned such a thing might happen. Edison tells me it has "since stopped this practice and expunged all such data in order to stay consistent with [the] company’s commitment to achieving the highest standards possible for ensuring privacy" — and that it now extracts only "aggregated and anonymized" data that's then made available to paying business clients in order to research e-commerce trends and "make their products easier to use" — but the stigma from that association and the ongoing use of some manner of personal email data for business purposes may still leave a bad taste in some folks' mouths. The verdict: The effective email sorting is nice, if somewhat limited in utility as a result of its implementation, and it might be just different enough from the other options out there to float the boat of a certain subset of Android phone-owners — provided, of course, that the various aforementioned asterisks don't serve as deal-breakers. The standout elements: Spike's messaging-like approach to email is without a doubt its defining feature. 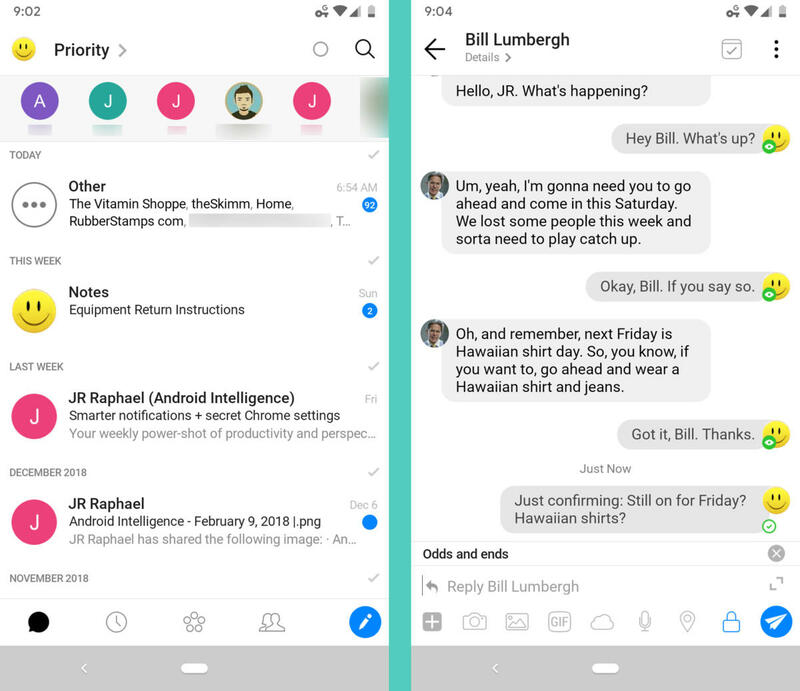 The app also sorts messages broadly to separate personal threads from more automated and bulk-oriented emails. Having your email feel like messaging really is a refreshing change, and it's unlike any other email experience I've ever encountered. The Slack-like presentation extends into group messages, which appear on your end as multi-person chat channels (even though the messages, including any that you send, remain formatted as regular group emails for anyone who isn't using Spike). If someone else you know is also using the app, Spike provides Slack-like indicators showing when the person is actively typing and if they've read your latest message. On a more basic level, Spike's sorting system has been incredibly effective for me, though it's far less nuanced than what Inbox offered and what other apps provide. Spike is available on Android as well as on the web and in native Windows and Mac clients — so basically, it's everywhere you'd need to be, allowing for a consistent cross-platform experience no matter what device you happen to be using. Attention, every other developer in this list: It's 2019. This is how things should be done. The messaging-like presentation brings a dramatically different feel to your inbox. It takes a while to get used to and probably won't be for everyone. It can also occasionally get a little weird with certain types of emails that don't translate naturally into that sort of format. The app tries to do a lot, which results in a fair bit of bloat you may not end up wanting. There's an integrated calendar, for instance, along with a dedicated voice and video calling system — part of the company's push to attract teams into adopting it not only for email but as an all-in-one communication solution. If you aren't part of a team that's tapping into all of that, you'll have a bunch of extra blubber to contend with. The verdict: Spike is one of the few truly fresh and original takes on email available on Android. If you want to put a modern twist onto email and try something completely different from the style of inbox you're accustomed to, it's well worth giving a whirl. The email service that's actually the most Inbox-reminiscent is something I looked at last year called June. It has a lot of promise, especially for the Inbox faithful — but as of this moment, it's available only on iOS along with Windows, Mac, and the web. An Android app is now supposedly in the works for sometime in 2020, the company's co-founder tells me, so it's something to keep an eye on. For heavy-duty emailers, a service called Superhuman (another one I covered last year) is also really intriguing. It introduces a ridiculously fast interface into email (in a genuinely noticeable way) and also gives you a robust shortcut system along with its own clever system for automating complex email-oriented tasks. But — a big but — (a) it's not available on Android yet, either, and the company has yet to release any specific info about when that might change; (b) it has a long waiting list to sign up and can take months to even get any sort of access; and (c) it costs 30 bucks per month to use, so it's clearly not meant for mainstream, average-person sort of use. For now, though, if you want a break from Gmail, you've got some interesting alternative apps at the very least worth exploring. They may be imperfect — but then again, so is Gmail, right? And heck, so is pretty much everything else in the world, tech-related or otherwise.